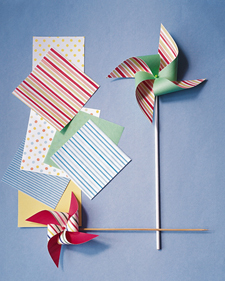 I'd been meaning to try out this cute paper pinwheels idea I saw on Martha Stewart so one day during craft time Claire and I decided to give it a go. First you cut out your paper into a square. Mine are 3.5". I was using left over scrapbook paper from Claire's circus party (almost 3 years ago) so my size options were limited. Then you fold it in half diagonally and then fold again. Unfold it and you'll see the lines. Using your scissors, cut on the lines about two thirds of the way to the point. Then start folding in every other point. Once the points are all in the middle poke a push pin through to hold them in place. This is where I realized I didn't have the map pins I needed to add to the middle to make them spin. So we improvised. I hot glued the points together. and made a garland to garnish the old window I recently purchased. Claire was disappointed they didn't spin so I still plan on getting the map pins to make some spinning ones for her. I think I'm gonna start making some for the guests at her Alice in Wonderland birthday party this year. Details to come!! !